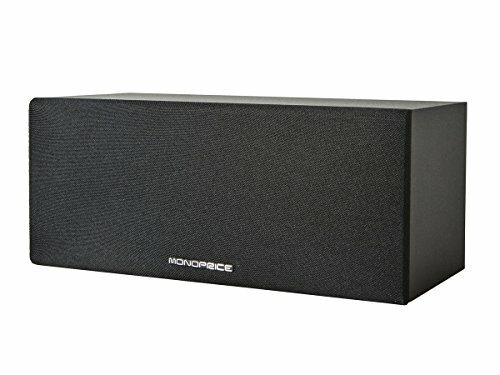 Get a great sounding center channel speaker to upgrade your current center speaker or to add a second to your system using this Premium Home Theater Center Channel Speaker from Monoprice! This speaker is identical to the center channel speaker included in our Premium 5.1-Channel Home Theater Speaker System (PID 10565). It features a 3" polypropylene mid-range driver and a 3/4" aluminum dome tweeter. It can handle up 100 watts of power and has an impedance of 8 ohms. The speaker handles frequencies from 110Hz to 20KHz ±3dB, with the crossover between the mid-range and tweeter drivers set to 3.5kHz. It measures about 4.3" x 10.2" x 4.3" (HWD) and weighs 3.0 lbs. This speaker is identical to the center channel speaker included in our Premium 5.1-Channel Home Theater Speaker System (PID 10565). It features a 3" polypropylene mid-range driver and a 3/4" aluminum dome tweeter. It can handle up 100 watts of power and has an impedance of 8 ohms. The speaker handles frequencies from 110Hz to 20KHz 3dB, with the crossover between the mid-range and tweeter drivers set to 3.5kHz. It measures about 4.3" x 10.2" x 4.3" (HWD) and weighs 3.0 lbs.